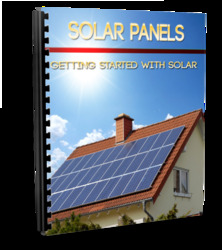 The photovoltaic systems can be classified according to their use and applications. These systems can broadly be classified into two types: (1) photovoltaic (PV) systems and (2) photovoltaic thermal (PV/T) systems. The first type can further be classified into space applications, stand-alone PV systems, grid-connected PV systems, photovoltaic hydrogen production systems, and miscellaneous small-scale applications whereas the second type can further be classified as PV/T air collector and PV/T water collector systems and others. Further, the stand-alone PV applications can be classified into two, agricultural water pumping and community or rural electrification. The PV/T air collectors can be used for agricultural greenhouse drying and space or room heating applications whereas the water collectors can be used for domestic and industrial water heating, water distillation (hybrid solar stills), space heating, etc. Some other miscellaneous applications of the PV and PV/T systems are also described later in this section. Now we will refer to each application one by one. The photovoltaic applications can be beneficial wherever the electrical energy is needed. The photovoltaic technology has always had an upper edge on other technologies as it is pollution free and it uses solar energy that is freely and immensely available. Here, in this section, we are discussing various photovoltaic applications based on their performance in terms of efficiency. Probably this was the very first application of photovoltaic that it was started in 1958 and used in space craft and satellites. The efficiency of the PV panels was 6%. The lightweight PV panels were used to power the space craft/shuttle for their electrical demands in space. In space PV cell technology, GaAs-based cells are now mature and space qualified. High-efficiency thin Si cells give good and impressive performances when price, weight, maturity, and efficiency are balanced. The efficiency of Si cells, high-efficiency Si cells, double junction, triple junction, and quadruple junction solar cells are 13.5%, 16%, 22%, 25%, and 28%, respectively (Habraken, 2001). The prime objective of stand-alone system was to support the farmers for their electrical demand for agricultural water pumping and for community and rural electrification. The community schools, hospitals and other government buildings were also benefited with this technology. Figure 3.2 shows a solar water pumping system as an example of stand-alone system. The farmers require water to irrigate their fields and the stand-alone photovoltaic systems can be used for that. The DC water pump uses electricity generated by the photovoltaic panels and then pumps water from a well to the fields. Fig. 3.2 Schematic diagram of an agricultural solar water pumping stand-alone system as an example of PV application. 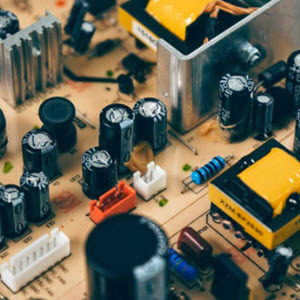 Attempts have already been made to connect a series of PV panels to generate a higher amount of electricity that can directly be given to the grid. To analyze the performance of a grid-connected PV system, certain parameters are important; they are yields (reference, array, and final), losses (array capture and system losses), PV and inverter efficiencies, and performance ratio. Based on above-said parameters Mondol et al. (2006) have examined the performance of a 13 kWp grid-connected photovoltaic system in Northern Ireland and found that the monthly average daily PV, system, and inverter efficiencies varied from 4.5 to 9.2%, 3.6%, to 7.8%, and 50% to 87%, respectively. 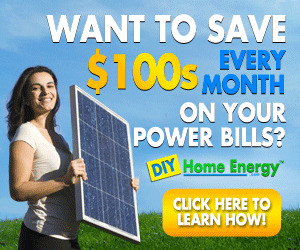 The annual average PV, system, and inverter efficiencies were 7.6, 6.4, and 75%, respectively. The monthly average daily DC and AC performance ratios ranged from 0.35 to 0.74 and 0.29 to 0.66, respectively. The annual average monthly AC performance ratios for the 3 years were 0.60, 0.61, and 0.62, respectively. and the electrolyzer efficiency as 52% and energy efficiency of PV panel as (minimum-maximum) 11.2-12.4%, charge regulator as 85-90%, inverter efficiency as 85-90%, and the electrolyzer efficiency as 56%. 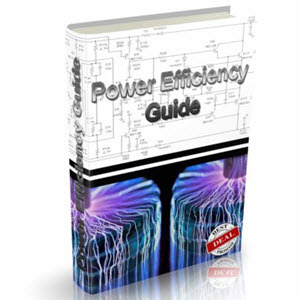 Based on the exergy and energy efficiencies of each component one can calculate the overall exergy and energy efficiencies of the system by taking the product of respective efficiencies of each components. The exergy efficiency of the system is calculated as (minimum-maximum) 3.68-4.32% and the energy efficiency as (minimummaximum) 4.53-5.02%. Another application of the PV technology is to use the PV panels on the rooftop of cars to harvest the solar energy and utilize the electricity produced to charge the batteries which further runs an electrical motor to power the car (Gaddy, 2003). This technology is still under development and can result in future generation automobiles. The street lights, traffic signals, solar lanterns, calculators, watches, dc fans, dc motors, inverters, etc., are some other applications of PV technology. 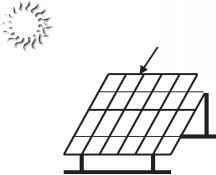 The PV/T systems came into existence with an idea to utilize the thermal energy of the sun along with the electricity. Use of thermal energy also improves the energy and ex-ergy efficiency and helps to maintain a good electrical efficiency of the PV system throughout its operation. The thermal energy available on the PV surface can be utilized for low potential works such as water and air heating. Further, the hot water/air can be utilized for various applications, for example, to heat up living space, greenhouse, solar dryers, solar stills, etc. In the next section we will discuss about the PV/T air and water collectors and their applications. Some potential applications of the technology are also discussed in brief at the end of this section. A photovoltaic thermal air collector utilizes solar energy for both electricity generation and thermal application. A greenhouse dryer is used to dry the agricultural products using solar energy so that it can be stored for longer duration. If a PV/T air collector is attached to the dryer, this would add more thermal energy to it and the drying process would be faster. The greenhouse drying can be done for both natural and forced mode of air circulation. Another application of this technology is to heat the living space. The space heating application further involves two types and they are transparent PV panels mounted on the roof of a building and PV panels installed on the ground and coupled with a living space. The former is an example of natural mode of heating a building as the transparent PV modules allow solar radiations to get inside the building and heat the living space whereas the latter is an example of forced mode as it uses a blower or a small fan to circulate the room air to come in contact with the collector and get heated. A PV/T air heater can be coupled with a building or living space as well. Charalambous et al. (2007) suggested that the building integrated PV/T collectors are most suited for low climatic conditions to lower the temperature of the PVs and supply the hot air for space heating. The greenhouse technology is also benefited with the use of the PV applications in order to maintain controlled environment in terms of temperature and humidity. Greenhouse may use a transparent photovoltaic panel mounted on the roof for its electrical demand to run electrical motors, fans, and blowers to maintain the desirable environment suitable for the crop production. Transparent panel also allows solar radiation to pass through it and heat the greenhouse environment. Similar to the air collectors, water collectors are used to heat up the water for various domestic and industrial applications. 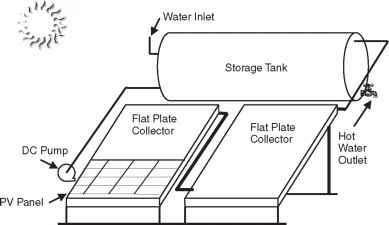 The domestic water heater generally uses flat plate collectors in parallel connection and runs automatically with the thermosiphon action whereas the industrial water heater uses a number of flat plate collectors in series and the thermo-siphon action does not work in this case and hence it uses a photovoltaic-driven water pump to maintain flow of water inside the water collector. A schematic diagram of a PV/T water collector is shown in Fig. 3.3. A DC water pump is used to circulate water as the two flat plate collectors are connected in series. Fig. 3.3 Schematic diagram of a hybrid photovoltaic solar water heater as an example of PV/T application. Another application of PV/T water collector is solar stills. Solar stills are used to purify or distill water and it is beneficial for the areas where brackish water has salinity of more than 10,000 ppm. This distilled water can be used in various industries like battery industry, hydrogen production industry, etc. Solar stills are coupled with the photovoltaic water collector and use thermal energy to heat water and electricity to circulate water through a water pump. This system is known as hybrid solar still and gives a reasonably higher thermal efficiency. Fish growing (aqua culture) requires a specific environment in terms of water temperature. A PV/T water collector coupled with a greenhouse water pond can be beneficial for the growth of sweet water fish. In order to maintain the desired temperature of water in the pond, the PV-operated water collectors can be used. To circulate water in the flat plate collector a photovoltaic water pump can be used. The other applications of PV/T systems can be in wine distilleries, medicine industries, dairy industries, etc., wherever active distillation is required.